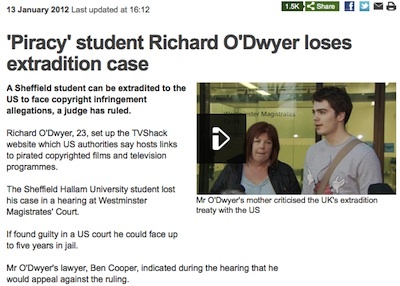 The case of Richard O’Dwyer has yet again brought the state of the UK-USA extradition arrangements into the public eye. Mr O’Dwyer is facing extradition in relation to charges for criminal copyright infringement relating to his TVShack website. That the website in question just provided links does not appear to be in dispute. The Press Release from the United States Attorney Southern District of New York. US Justice Department describes the site as a “linking site”. The extradition appears to me to be unjustified. Mr O’Dwyer has not, according to what’s been published, committed the alledged offences in the USA, and what he’s done appears perfectly legal in the UK. If Google was a UK based company we could, if the same arguments were applied and the same conclusions reached, be seeing the UK courts agreeing to a request from the USA to extradite the company’s bosses. I’m concerned that given the state of the UK’s extradition laws, and the way they’re being applied, people will be deterred from getting involved in business which might bring them to the attention of the USA authorities. In the case of O’Dwyer there appears to be no justification for the case to be heard in the USA. District Judge Purdy appears to have taken the view that the USA can seek to enforce its laws around the world irrespective of if the alleged crime was committed in, or even had any connection to, the USA. The UK should be standing up to the USA asserting its law is global law. The Home Affairs Select Committee is currently carrying out an inquiry into extradition. The committee held an evidence session on the 10th of January 2012.They heard from Mr Bermingham, one of the NatWest Three who was extradited from the UK to the USA. Mr Bermingham explained his concerns about the justice system in the USA, which, from the evidence given, sounds as if its much worse than ours at encouraging innocent people to plead guilty. Mr Bermingham also called for UK judges to be given more freedom, asking for them to be able to consider which country it is most appropriate to hold any trial in. The judge considering the extradition request would be free to refuse extradition (and enable a trial to occur in the UK) if some of the relevant activity took place in the UK. Clearly this would apply to the Richard O’Dwyer case, as well as other high profile cases such as that of Gary McKinnon. I hope that if any change in the law does occur it is retrospective, to the extent that all those in the UK facing extradition, and for example, in the process of appealing decisions by UK judges to extradite them, are able to benefit from them. On the 8th of September 2010 the Home Secretary, the Rt Hon Theresa May MP, announced that the Government would review the United Kingdom’s extradition arrangements. I think where a crime is mainly committed in the UK the person should be tried here. The review report : Independent review of the United Kingdom’s extradition arrangements was published on the 18th of October 2011. Other questions such as extradition for questioning don’t appear to have been addressed and there the report does not detail why the arguments put forward by those lobbying for change have been rejected. Overall I am unimpressed by the review’s report. Transcripts (or summaries) of the oral evidence sessions would have been a useful thing to include in the report, perhaps making the report more useful to others, such as MPs, who might want to draw their own conclusions from the evidence collated by the review. I hope the Home Affairs Committee will take a different view from those appointed to conduct the “Independent” review on behalf of the Home Office and prompt a reform of our extradition laws. The Home Affairs Committee are focusing on the particularly problematic areas of USA extradition and the operation of European Arrest Warrants whereas the independent review tried to look at all aspects of extradition. Page 483 of the extradition review report gives the cost of running a magistrates court as £400/hour on average in the UK. (I just wanted to note that as it’s an interesting statistic). I’m not sure about that statistic; Prison Reform Trust puts the cost of a crown court case at £30,500 . Depends on what you’re counting – I bet the review report only covers some of the costs to courts.